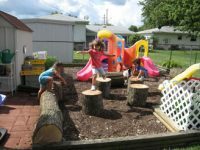 Debby Ortega, owner of Little Treasures Home Day Care, and her children have really been excited about getting ready and preparing their yard for certification as a Nature Explore Classroom. The children helped design the play space and participated in all aspects of making the drawing come to life. By doing so, they have taken more ownership of the space and now help with care and maintenance. The whole certification process has been a summer project and the children loved it! The children developed the gardens from beginning to end by discussing the materials needed, preparing the earth, planting and caring for the plants, watching their growth and eating the fruits of their labors. 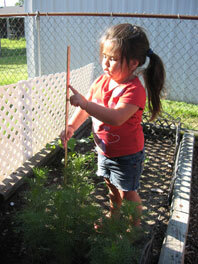 The plants were measured every week and a growth chart was kept. Discussions follow on why some grow tall and some grow wide. Plenty of shovels, rakes and hoes are available for little hands to keep busy. Slowly, all the plastic items are being removed and elements made of wood replace them. Tree cookies and various sized miniature bricks have been added to the Building Area. Shells, chalk, pine cones and buckeyes fill the Nature Art Area. A crib is being broken down and will be re-purposed into art easels. Paint cans hold colorful flowers which are attached to the fence. Most of what is included in the classroom are reused and re-purposed and also include many seasonal items. Wood items are added that are low maintenance and sturdy. A daily walk of the neighborhood provides treasures for the classroom. The children collect acorns, buckeyes, sticks, rocks, leaves and many additional items. Pictures of the classroom in progress were posted on the Facebook page and the families shared activities with their children from The Families’ Club. Now, the children take their parents to the Nature Explore Classroom on a regular basis to show them all that is happening in the Nature Explore Classroom. Debby Ortega would like to thank Child Care Resource Center for supporting her through the certification process and also Shared Solutions Alliance for introducing her to the Nature Explore program and providing all of the log items including the table and chairs. Her outdoor space wouldn’t be all that it is without their support. 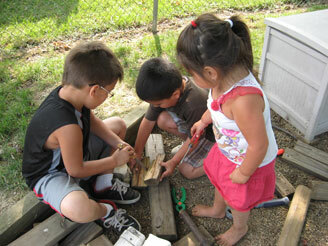 Debby also states that the children’s play is more purposeful now and they love to explore the natural materials. Just the beginning of what she would love it to become. Each year, they will add more plants to naturalize the yard.